Well water is not always a perfect product. Filtration is sometimes necessary to give the quality drinking water we require.The water we consume has a great effect on our health and the infrastructure of your home. 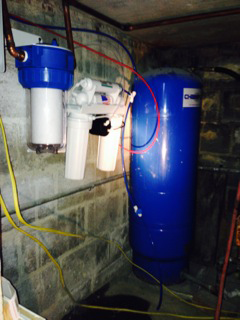 Proper filtration of your water can keep you feeling good and cut the costs of repairs to your home and appliances. Water testing is key to filtration. H2O SERVICES offers free water testing and free estimates. In our area “Iron” is one of the most common minerals in well water. It can create brown and red staining on fixtures, make laundry dingy, clog water heaters and make your skin very dry and irritable. Ground water can be acidic (low Ph). Water with a low Ph can be very aggressive dissolving pipes, fixtures, water heaters and furnaces. It can leach out heavy metals in the plumbing to which you then consume. One of the indicators of acidic water is a green and blue staining on fixtures and copper plumbing pipe. As water flows through fractures in the rock and into your well it picks up small grains of material. This material can be a nuisance, clogging sink aerators, water heaters and wearing out appliances. A whole house filter is an economical answer to this problem. We use a filter made in Italy and very user friendly. Reverse Osmosis system deliver the highest quality drinking water. Most bottled water or other bottled drinks very likely were made with water that went through a R.O. filter. Most R.O. systems are what would be call a “point of use” filter. What that means is that the water would only come from a specific fixture, not the whole house. We offer several different R.O. setups to cover all needs and budgets. A U.V. light is an effective tool to ensure your drinking water is free from bacteria. For a U.V. light to work properly the water quality must be at a high standard. There is a test call “transmissivity”, this to see if the light from the U.V. will be effective in the water stream.